as soon as i made my first grainline studio moss mini i knew i would be making another. it so happened that when i made my denim thurlows earlier this year i used my ninja layout and cutting skillzzzzzz and had quite a bit of denim left over. just enough for a skirt! oh yes, i’m that good. 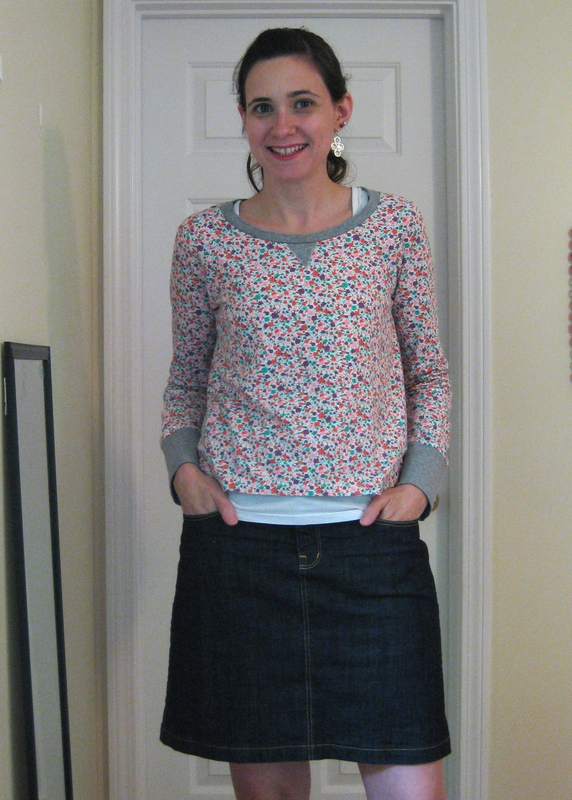 so i wanted to go full on denim skirt here and go crazy with the topstitching and pockets and belt loops. the whole deal. first thing i had to do was modify the front pocket situation. both the thurlow pattern and the moss mini have the “pocket gape” feature where the pocket stands out just a bit from the body. due to the position of the pocket opening (a slant as opposed to a more vertical slash opening) the gape makes it so the pocket is useable. 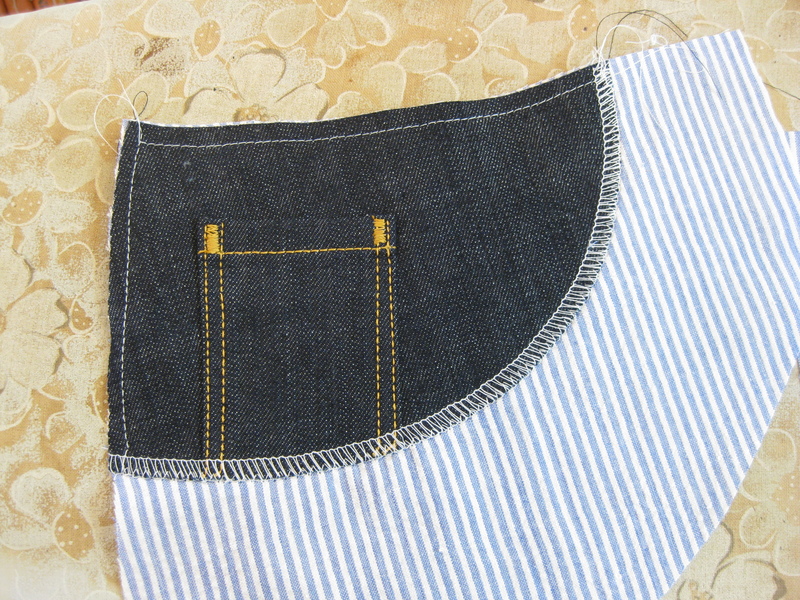 in order to get a classic jeans pocket shape i had to eliminate the gape, then draft a rounded opening. i even added a coin pocket. one feature of this pattern is that the pocket bags extend into the fly construction. it gives them great stability and helps everything lay nicely. however, it does create some bulk around the fly facing and attaching the zip to the underlap, so i may modify this if i make the skirt again (which i most likely will). also, the fly construction method was completely different than any other method i’ve seen. 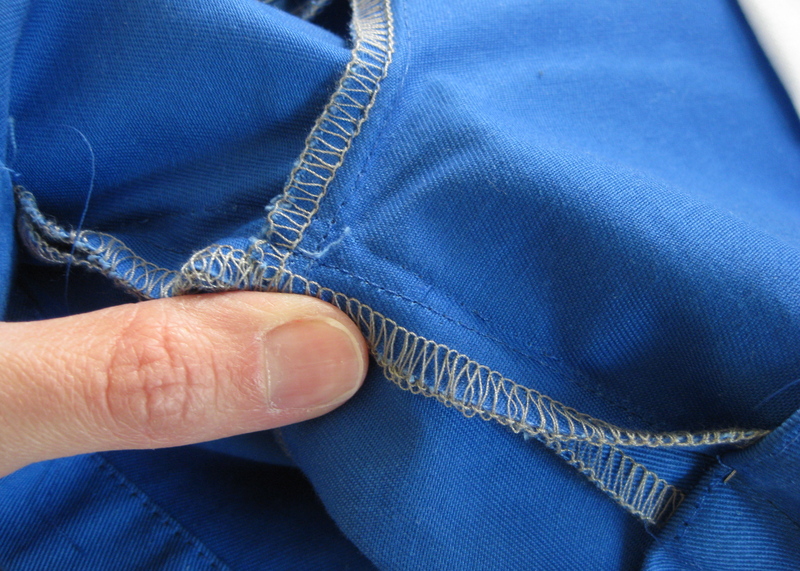 you sew up the entire overlap side and topstitch it before sewing any of the underlap. admittedly, i have mixed feelings on this… due to the pocket pieces also being sewn into this seam, and my heavy-ish denim, i lost a bit of SA to turn of cloth and i barely had enough room to sew the zip to the underlap side. i think it would be good to have a little extra SA on the underlap to make sure there is plenty of room. that said, i’m very intrigued by this method as it is completely new to me! i am totally pleased with the fit i achieved. based on my last make, i decided to go up a size in width on the back pieces, then shave about 1/2″ off the CB yoke at the waist tapering back out over le bootay. 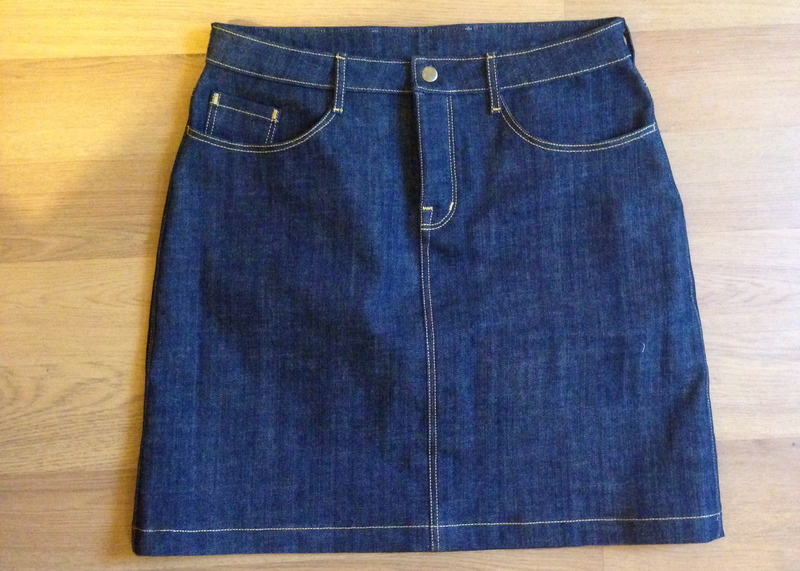 i also cut the waistband with 1/2″ less at CB to compensate. this worked out perfectly and, for a girl who has had to deal with gaping waistbands all her life, it is so thrilling to have complete coverage. no gape. i can sit on the floor with the kiddos and it still holds snugly over my rump. oh and i lengthened the skirt in place of doing the hem band. i went all out with top stitching. i am by no means a perfect top stitcher, so i cheated a little and used my blind hem foot adjusted to use as a guide for edge stitching, then a 1/4″ quilt piecing foot for the second row. seriously easier than driving yourself crazy doing it by eye. also, i would have loved to flat-fell my seams, but i figured i could only ask so much of my machine. the bulk would have just been too much, and i’m pretty content with serged and faux-felled SA’s. last thing: i use a fairly entry level babylock sewing machine, but no matter what machine you use, you can’t expect it to breeze through bulky denim seams without using a proper denim needle. i can’t stress this enough. i’ve used regular needles for heavier weight fabrics and end up with broken needles and top stitching that is all wonky. 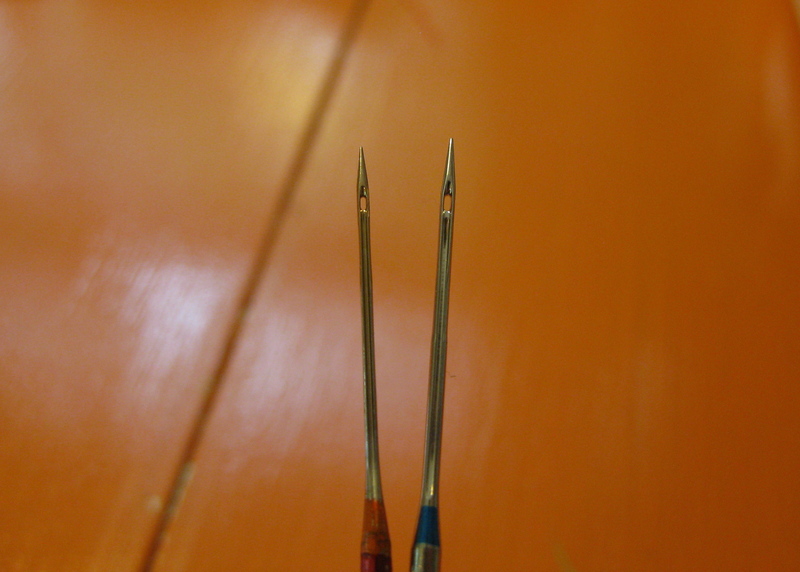 not only is a denim needle stronger, the eye is wider to accommodate thicker thread (hello top stitching!). also helpful: a hammer nearby to whack those bulky seams into submission before top stitching. makes a huge difference. plus, it’s just fun. 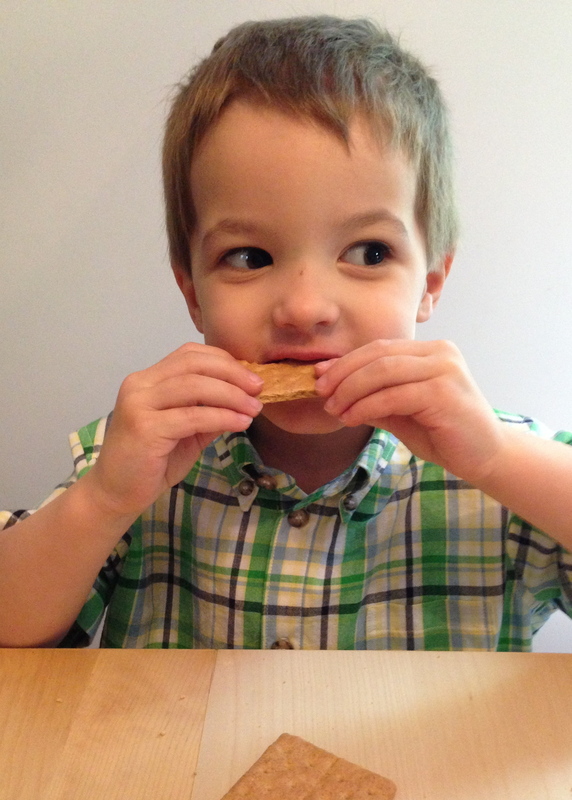 i, lisa g. of notes from a mad housewife, sign up as a participant of me-made-may ’13. i endeavour to wear me-mades at least 4 times a week for the duration of may 2013.
the links below are to my original blog posts; my posts have links to pattern info. sorry i’m so late on posting week 3! the hassle of taking and posting daily pics is showing… that and i can’t seem to keep track of what i wore on which day. thank goodness for digitally embedded dates! last week up ahead… finish line, here i come! 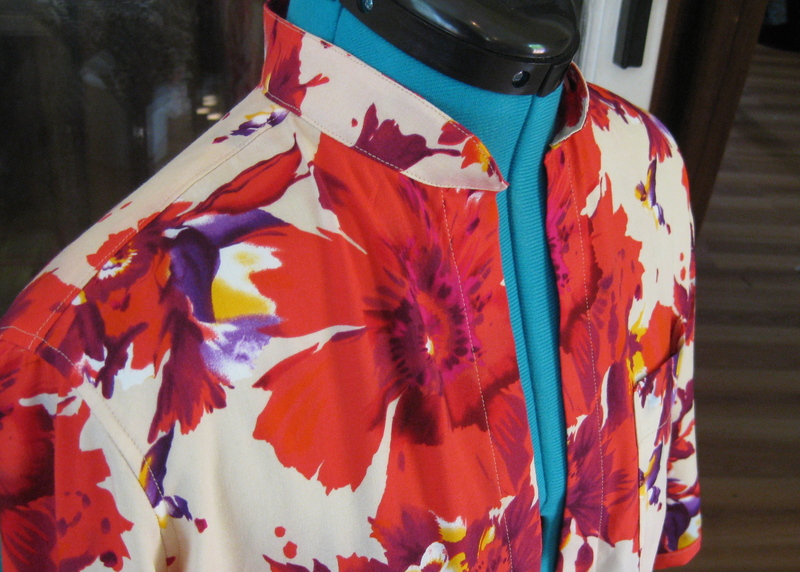 i bought this great rayon challis (here i go again with the rayon… i just can’t quit you!) from my semi-local fabric haunt. it’s a van gogh free spirit print. i was in love with the giant red flowers, and despite the quasi-hawaiian/old lady vibe it gave off, i had to have it. i bought 1 1/4 yards because i intended to make a tiny pocket tank. but… i wavered and became concerned that the ivory background would wash me out as a tank and decided to try and get an archer out of it instead. hear me out! i reasoned that if i nixed the collar, shortened the sleeves, left off the front placket (instead, cutting both front pieces the same, turning and stitching for a faux-placket), only did one pocket, and used a different fabric for the inside back yoke i could probably pull it off. i had this all worked out in my head and was pretty set on this plan when i laid out my fabric and remembered that this fabric is 45″ wide. 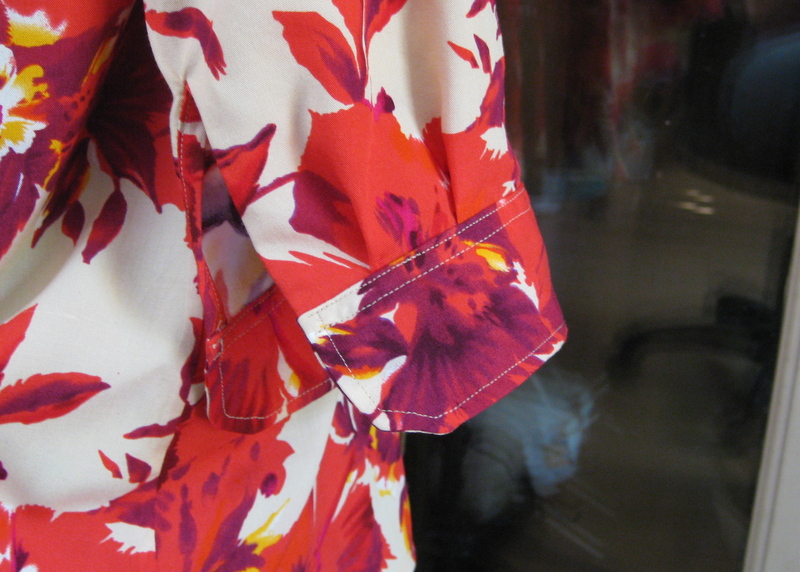 and it has a giant floral print that will be difficult to match with such a limited amount of fabric. now, you may not know this, but i’ve always prided myself on my ability to save fabric so i started laying out my puzzle pattern pieces and managed to make it all work. i approach fabric cutting as if i am in some crazy WHO CAN USE THE LEAST AMOUNT OF FABRIC?! competition. that should totally be a thing, imo. i even matched the print across the front. who’s a badass seamstress? that would be me. i kept going, ignoring the weird collar thing and did one cuff. now, stupid me didn’t think to make the cuffs larger since they were going to sit just below my elbow and not at my wrist. i slipped the shirt on after the first cuff and realized there was no way it would button. i had imagined i would roll them up, so i tried that and it sat in such a funny spot that i couldn’t bother to sew on the second cuff. so i let it sit another few days while i stared at the whole thing deciding what to do. it was such a beautiful cuff, i was so sad to cut it off! then i remembered a post gail did a while back about different cuff treatments and it inspired me to try something new. the only catch was, i had exactly no useable scraps to make up new pieces with. there was nothing left! 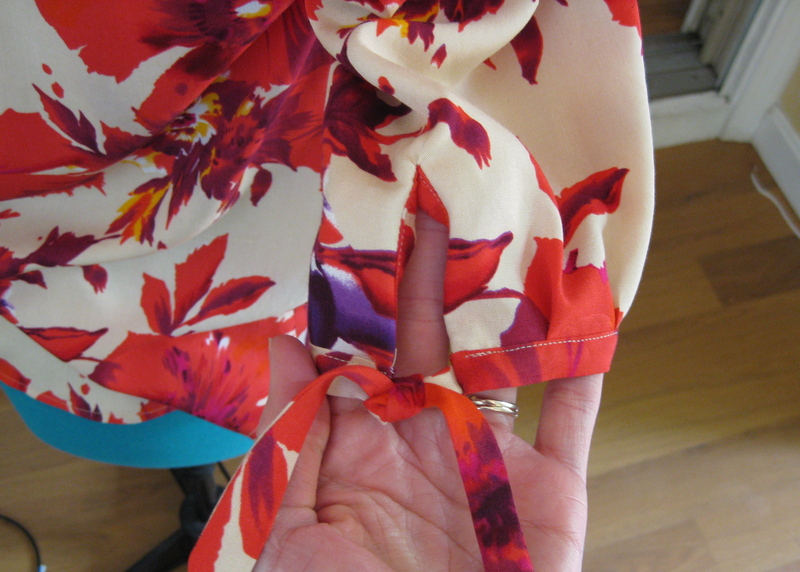 fortunately, i hadn’t sewn on the second cuff, so i cut it into strips, bound the bottom edges of the sleeves while inserting little ties that i could knot in place of buttons (looking back at gail’s post, i even commented on how much i loved cuff ties! haha!). in hindsight, i should have interfaced the sleeve binding strips, but i think i can deal with it. so the sleeves were taken care of, i hemmed the shirt, then contemplated the collar for another day or two. i was almost ready to slice off the collar stand and work out a facing of some variety to finish the neckline when i figured maybe i should wash the shirt first and see if the collar loses some of the crazy stand-at-attention look. after washing and pressing, it was just drapey enough to keep me happy. 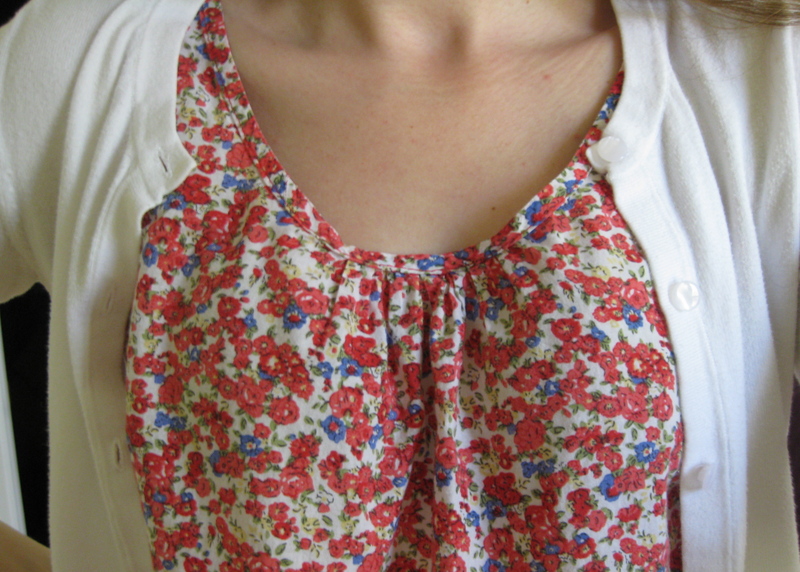 i made my buttonholes, sewed on my buttons, took a shower and put my new top on. i love it. all the will it won’t it stress gave me a cute cuff i wouldn’t have done otherwise, and a freaking button up shirt out of the most minimal cut of fabric possible! pleased with myself? you betcha. NOTE: i made some size adjustments because my last one was a little too off the shoulder for my liking. i graded from a 0 in the shoulder to a 2 underarm to a 6 at the waist out to an 8 or 10 at the hip. that must be the world record for most extreme pattern adjustment ever. in reality, i was simply taking the shoulder in closer than drafted, then allowing plenty of room for le hips. still holding strong! truth be told, i wear my me-mades a lot. this last year i’ve made an effort to make useful pieces and it’s nice to see that effort pay off. obvs, documenting is a problem… sorry for all the selfies, and bad ones at that! i make no promises to improve. hey, points for being realistic? i do wish i could document the outfits the rest of the family is wearing—it seems like every day at least someone else in the family is wearing a me-made. maybe next year i’ll up the ante and share more of that! generally my trips to joann fabrics are to restock my machine needles, buy thread, or hit the latest pattern sale. 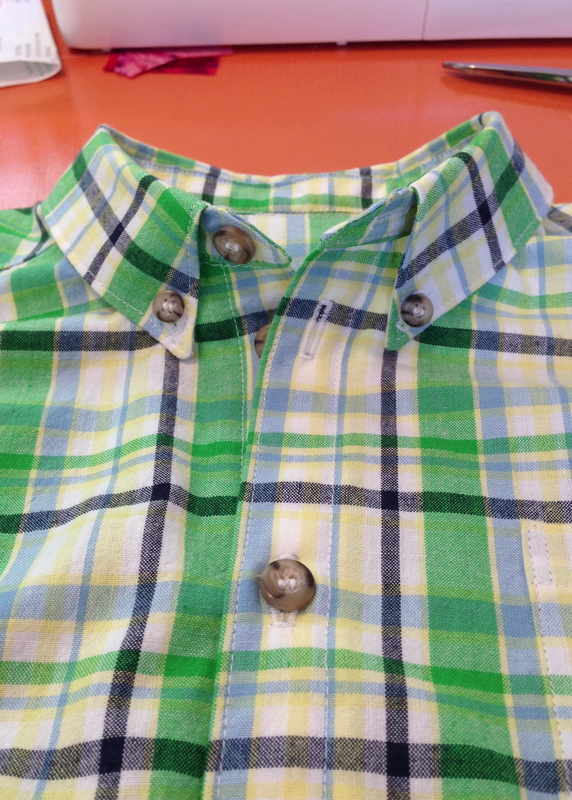 lately i’ve learned to scout out the clearance table on the hunt for a passed over gem, which is where i found this plaid shirting fabric and snatched up the 2 yards left on the bolt for $5/yd or so. 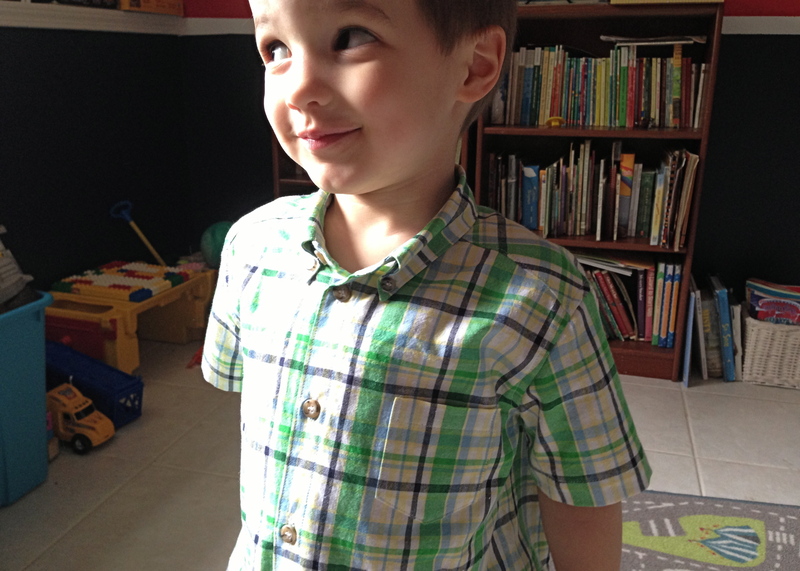 i decided to make a new button up shirt for my 4 year old son, oliver. 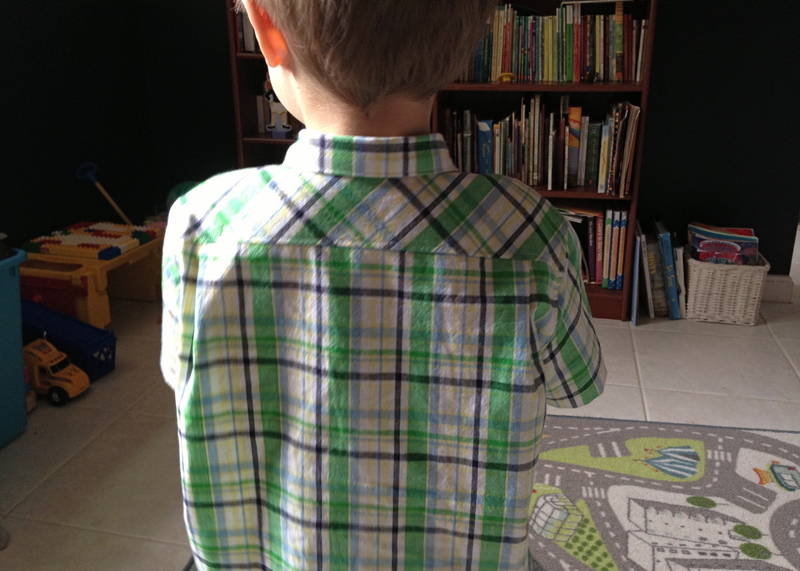 in case you haven’t noticed i’ve been on a shirtmaking kick lately, and who doesn’t love a little boy looking dapper in a mini man shirt? i’ve been hunting for a pattern for weeks and everything i found with a regulation collar and stand was either in baby sizes or bigger boy sizes. 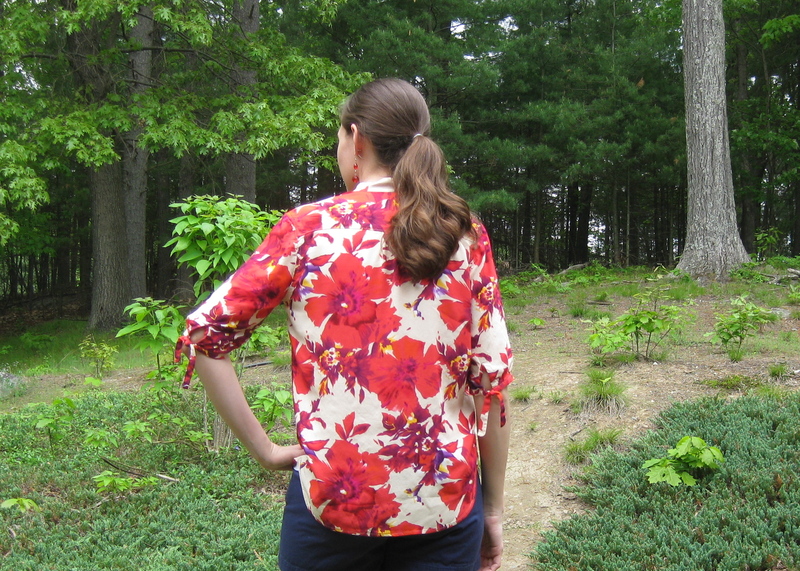 i finally settled on burda 04/2013 #141 and drafted my own collar. it’s a mandarin collared shirt, so at least half the work was done for me. i took some measurements, eyeballed it and called it a day. even though this is a kid shirt, i was able to pull out the collar tricks i’ve learned from david coffin’s “shirtmaking” book. i should get royalties for hawking that book title so much, but it’s a must-have! 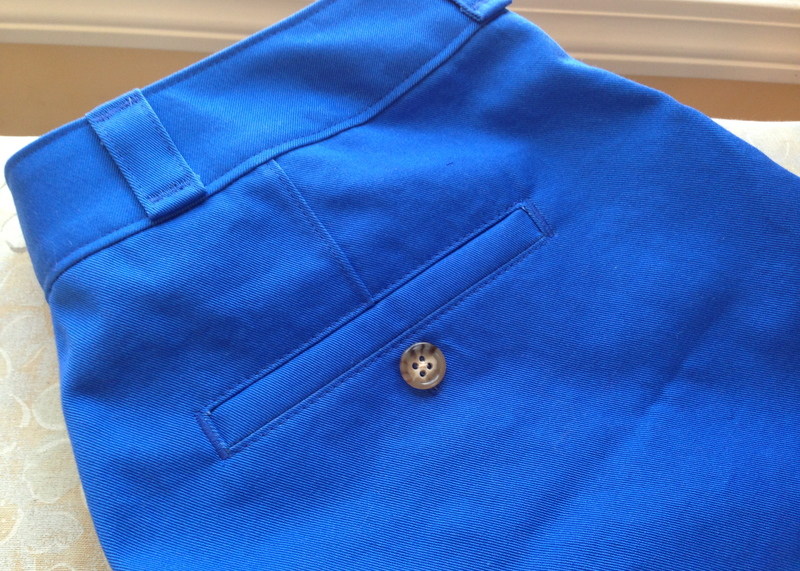 i swapped out the welt front pocket (why a welt front pocket, burda?) for a regular front pocket. there was no back yoke, so i slashed the back piece and made my own, then added 1″ to the center back to allow for pleats. 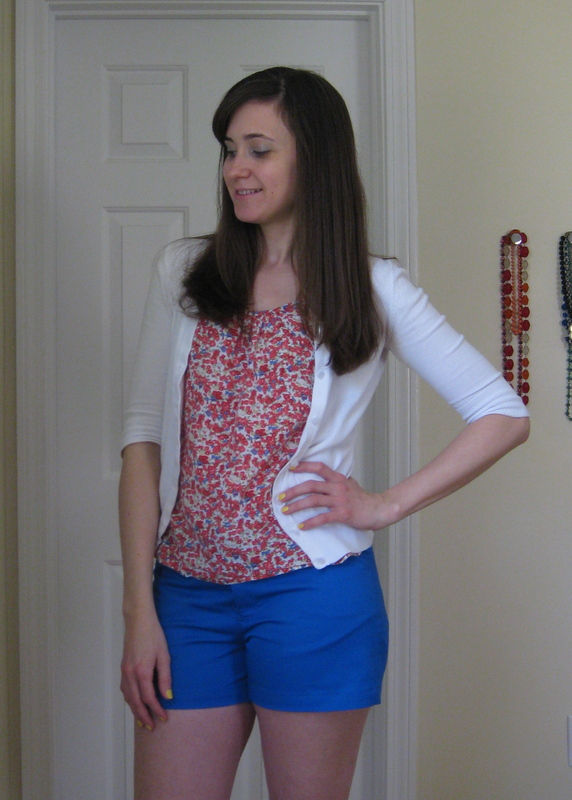 then, lastly, i nixed the long sleeves in favor of short. i made a EUR 110 (US 5) and it’s still pretty big, but this is fine by me. he’s small for his age, and generally i’ve found the sizing on burda’s patterns to be pretty reliable; at least he should be able to get a solid year of wear out of it. next time i think i’ll make the collar a little wider, but overall i’m pleased that i have a good pattern for when he needs another mini man shirt. 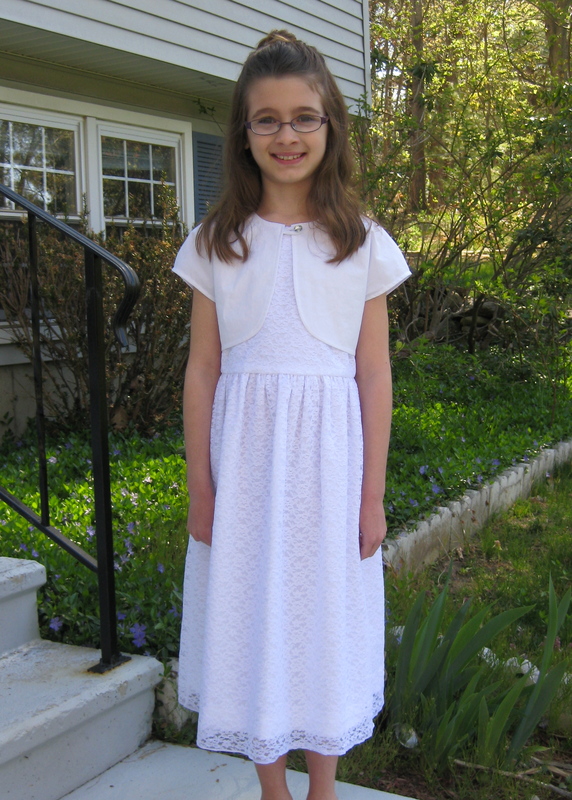 my oldest daughter made her first communion the other weekend, so i made her a special dress for the occasion. truth be told, i’ve been thinking about this dress for a long time and had visions of beautiful hand work, beading, lace, tulle… you get the picture. i feel bad that time got the better of me and i ended up only having a couple days to make it. it’s been a busy spring and i haven’t had as much sewing time as i would like. i was also finishing my jacket and doing costume alterations for my girls’ dance studio on the side… basically i was too tired to come up with anything interesting. 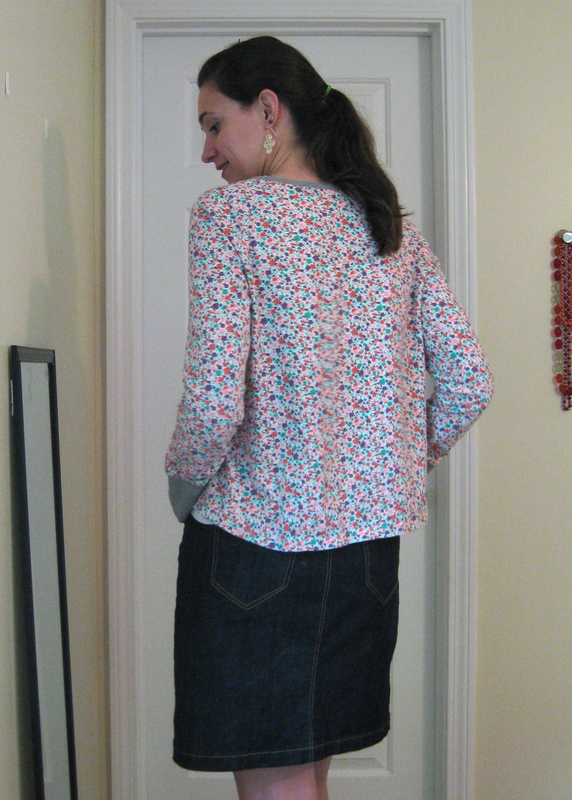 knowing i had to keep it simple, i picked out new look something or other (trying to look it up but their site won’t load and i’m impatient) because it has a nice low back neckline that i thought was pretty, and includes a bolero pattern. i used a stretch poplin for underlining the lace bodice, and lining the skirt. i added an additional lining for the bodice since i had some bemberg scraps laying around. then i found some sparky buttons for the back closure and for the bolero. i made a size 8 (she’s almost 9) but it turned out to be huge. H-U-G-E. i could have gone down two whole sizes easily! i was pretty disappointed in the fit. no, i didn’t measure her to determine size, but i’ve made other patterns and gone with her rtw size just fine, so i didn’t think it would be that off. she loved the dress so i didn’t bother her with my own disappointment. and technically there’s nothing wrong with it, it’s just huge! fortunately the bolero covered up the back where the ill-fit is most apparent. of course, the back was my favorite feature, so… there you have it. i’ve been kicking myself for not making a waist sash, or a hem band… i suppose i shouldn’t be so hard on myself, she looked lovely. but, seeing all the other girls in their ridiculous poofy gowns (one girl had a strapless dress. strapless. with a corseted lace-up back. whaaaat? how is that appropriate?!) 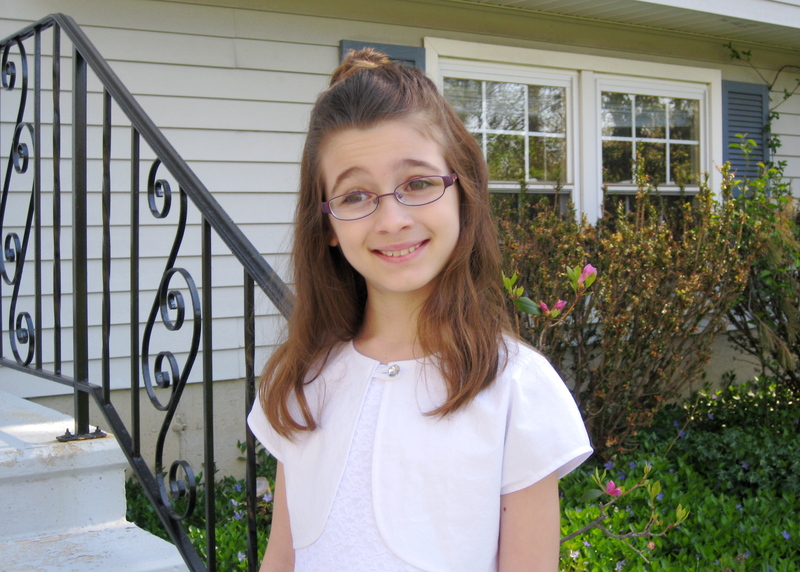 and the audible crunch every time they sat down… i guess i was afraid she would suddenly wish her dress were fancier. seriously mom… are you done taking pictures yet? alright, more sewaholic love here! 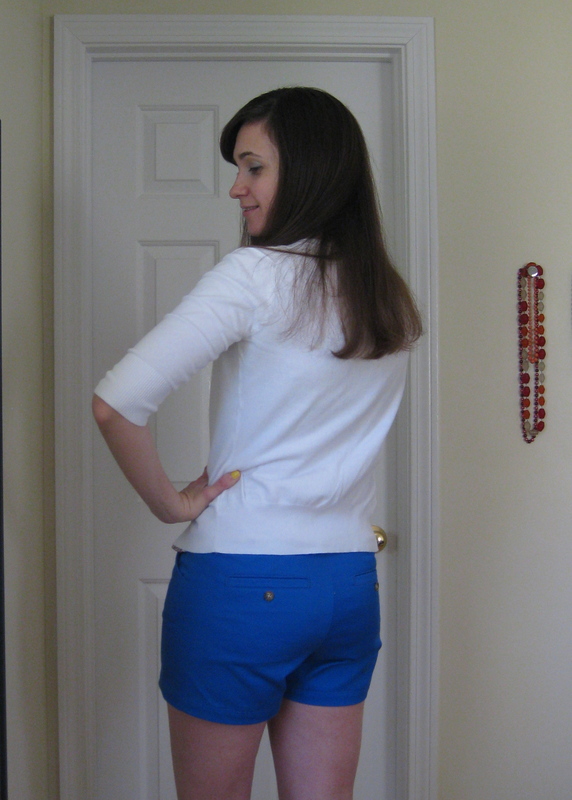 i think i can officially call the thurlow my TNT pant pattern. 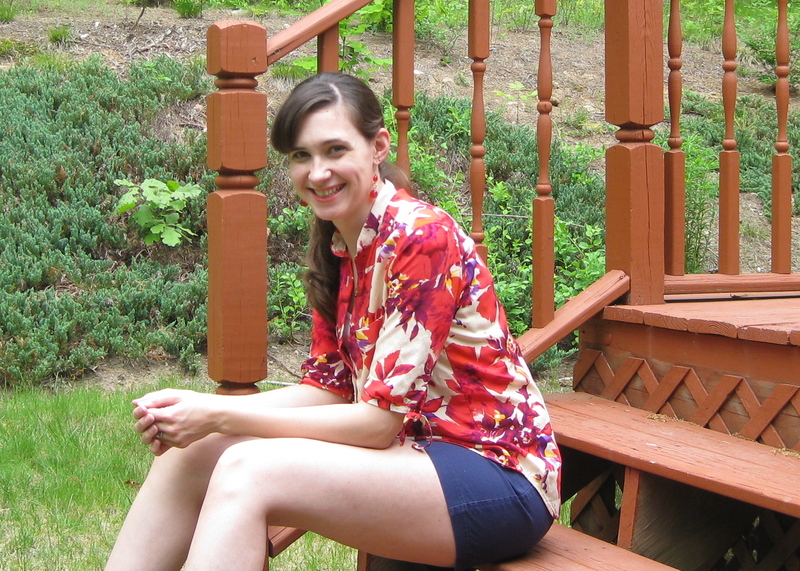 a year ago i made shorts using mccalls 5391 which was a decent pattern, but it lacked all the little profesh details i was craving and had to subsequently draft myself. that pair fit pretty good, but then the thurlow came out, i made it, and it fit so much better that i rarely wore my old mccall’s. so a month back i was digging through my fabric scraps and discovered that in fact i had almost an entire yard of that royal blue twill left. wooo! i wavered between using it for shorts or another moss mini, but decided to go ahead and make shorts and i promptly chucked the old mccall’s into the giveaway pile. grrr…. blurry pic… sorry! sorry! since i’ve made this pattern twice before, i went ahead and chopped off the middle back extension pieces and constructed them without the wide CB SA. but one thing i wanted to adjust was the front rise. i lowered the waist seam about 3/8″ at the CF and that seemed to fix some wonkiness i was having in the fly area. 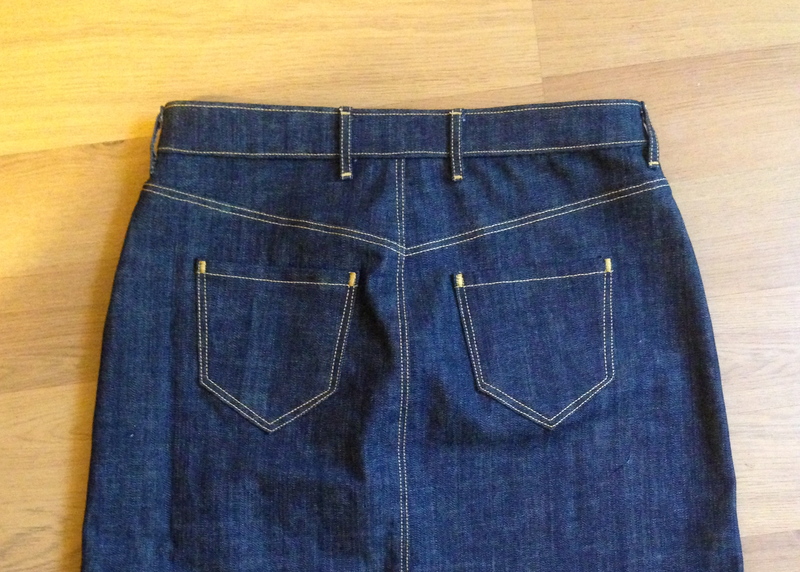 i made up the back pockets like i did for my denim thurlows (single welt poppykettle style) with button closure. i also tapered the legs in slightly and shortened them from the cuffed version to a 3 1/2″ inseam. 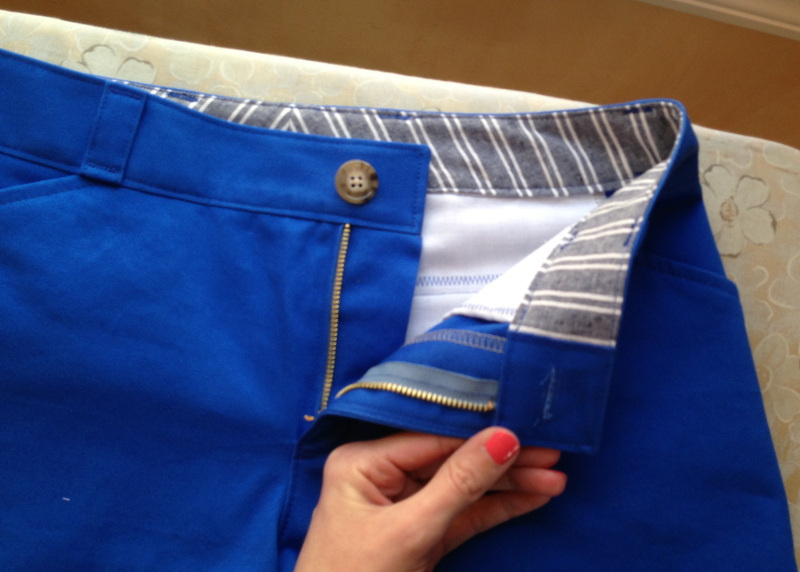 so what is my huge pant-fitting revelation you are no doubt wondering? here ya go… i’m not sure if this twill just has less give than the other fabrics i have used for this pattern, but this pair seemed a little tighter than my previous makes. i was getting some pretty pronounced wrinkles pointing toward the front crotch area. i spun around in front of the mirror a few times trying to figure out what exactly is causing the problem and it finally dawned on me that i needed more depth front to back. i’m no pant-fitting guru, but i think it’s a combination of le bootay, the mommy tummy, and a protruding thigh (hey now, i run several times a week… i have “strong thighs”). so, my behind was pulling from the er, behind… and since my tummy and thighs were pushing the opposite direction, i ended up with front crotch wrinkles from this little tug-of-war. i don’t even want to know what sort of perv google hits i’m gonna get after this post…. fortunately i had some seam allowance to work with and a construction method (constructing the entire front, the entire back, then attaching them at the inseam then the outer seam) that allowed me some adjustment room. i unpicked the inseam then re-sewed it at 3/8″ tapering to nothing at the hem. 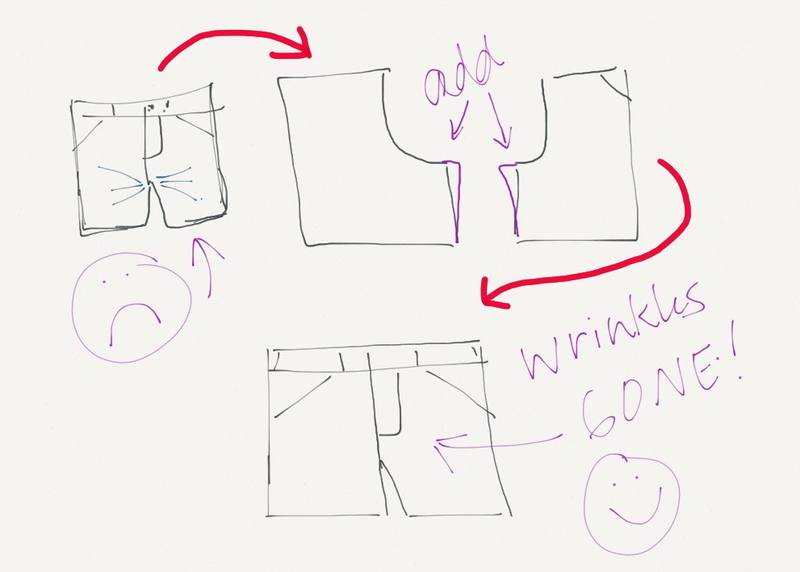 this gave me an extra 1/2″ of depth in the crotch curve and greatly diminished the wrinkles! i still have some wrinkling as you can see, but it’s way better than before. wow, totally felt like i learned something about pants on that one. hopefully i can make another pair shortly (har, har, har…) and tweak this even further. and if the fabric for my top here looks familiar, it’s a sorbetto made from the same fabric as my eclair dress. i made this last summer, though it never made it to the blog. 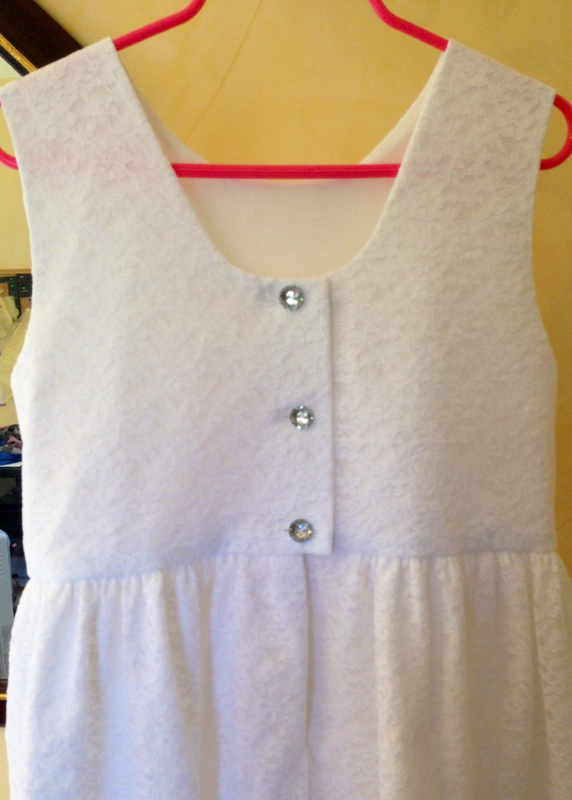 i swapped the center pleat for gathers and lengthened it. i wish it were longer, this hem length isn’t totally flattering on me, but it still gets a lot of wear because i just love that print so much. it reminds me of the way out of my budget liberty prints, but this i picked up for $2/yd last year on clearance. can’t beat that!